So with the C chord you were alternating your bass notes between the 5th and the 4th strings. For a chord like G where you have a note on the 6th string, it’s most common to alternate your bass notes between the 6th and the 4th strings. Just like before, start out just getting used to the alternating bass first before adding in the rest. Even though in the next example you will never play the 5th or 1st strings of the G chord…it’s still good to place your fingers down on the whole chord for a few reasons. For one, if you accidentally hit a wrong string, you want the note to be one that’s in the chord and will sound good. Next, even if you don’t hit a wrong string, the strings can start ringing by themselves from the vibration of the other strings. So again better to have a note in the chord that’s ringing. And last, we are just working with basic ideas in this guitar lesson. You will definitely be playing patterns that use all of the strings as you explore the Travis Picking technique a little more. Just like with the C chord, the next step is to add in the 3rd string with your right hand 1st finger on the & of beat 2. Finally play your 2nd string with your right hand 2nd finger on the & of beat 3. Once you are comfortable playing the basic Travis Picking pattern on the C and G chords separately, try switching between both the chord for 2 measures each. You may want to build up to the full pattern. First just play the bass notes only, then add the 3rd string…then the 2nd. Here is a short little Jam Track to give you a steady beat to practice with the last example. It’s just drums and bass. You can download an MP3 of this jam track below. There are a lot more things you can do with Travis Picking on the guitar, but this guitar lesson has hopefully helped you get started with this style of fingerpicking. 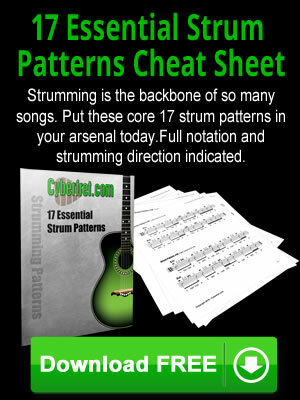 Try practicing these patterns with other chord progression as well. Right Click on the links below to save the files to your computer or other electronic gizmo. MP3 Jam Tracks and guitar lesson printout.